Boil water in a medium sauce pan and blanch beets for one minute. Using a slotted spoon or a colander, take the beets out of the hot water and keep them in a bowl. Heat olive oil in a saute pan and cook the pancetta and until brown. Add garlic and shallots and cook until soft, about one minute. Add the beets, 1/4 tsp salt and pinch of red chili pepper flakes and sautee for three minutes. 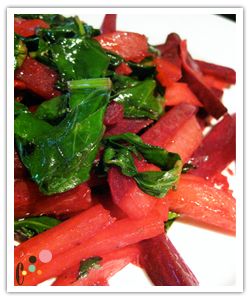 Add beet greens and the rest of the salt and pepper and cook until greens are lightly wilted for a few minutes.